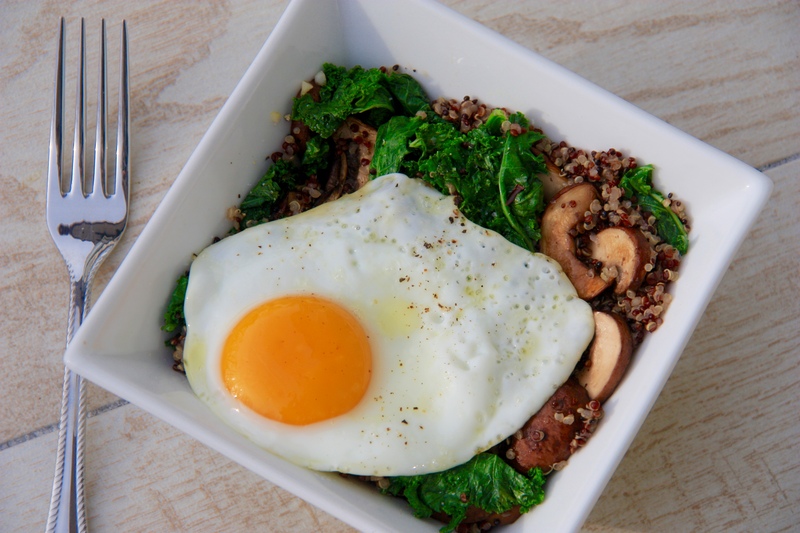 This nutritious brunch bowl will give you that perfect energy boost that will help get you through your busy day. It’s also the perfect way to use up any left over veggies you have on hand. In a non-stick medium frying pan, drizzle olive oil over medium heat. Add mushrooms and saute until golden brown. Season with a pinch of salt and pepper. Set aside in a medium sized bowl. Turn the heat to low and add a drizzle more of oil. Add the garlic, kale and flakes and saute until the kale is bright green and beginning to crisp and keep a watchful eye on the garlic that it does not burn. Add to the bowl. Turn heat back to medium. Add a touch more oil to the frying pan. Add the egg and cook until desired doneness. Meanwhile, add the quinoa to the bowl and mix to combine with the vegetables. Slide the cooked egg on top of the mixture. Season with salt and pepper. Serve and enjoy! Feel free to add any other leftover vegetables to the mix!